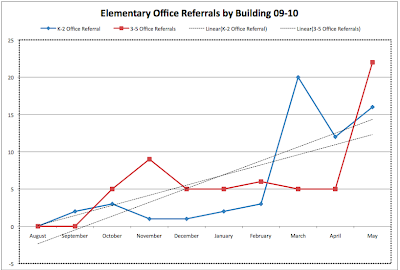 You can see that as the year progressed, we either got better at inputting our office referral data, or our office referrals increased substantially as the year passed (probably a little of both, to be honest). 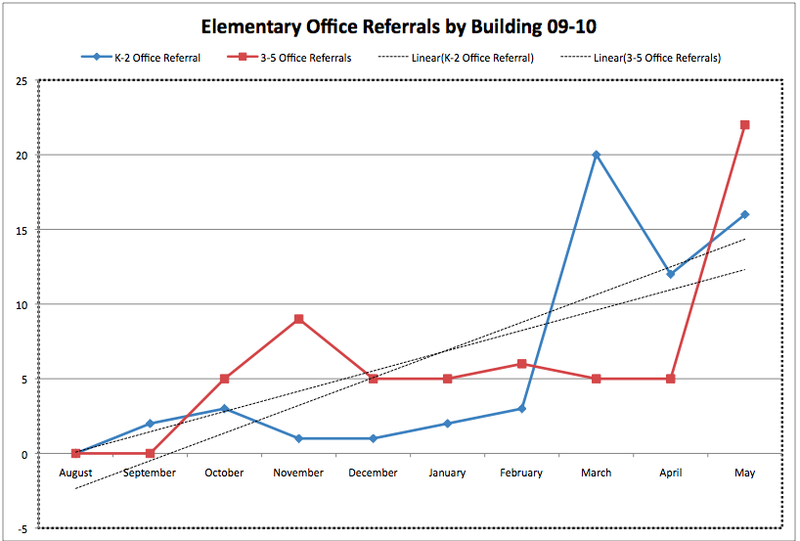 This data will be interesting to compare from year to year as we look for trends, and the data will also allow us to identify time periods in which we need to develop proactive plans in order to decrease referrals. June - What Does an Elementary Principal Do During the Summer, Anyway? The hallways are barren, the classrooms empty, lengthy phone conversations rare….what in the world does an elementary principal do during the summer anyway? Most people have a belief that summer means three months of vacation for an elementary principal….while time is definitely more flexible, this is not only a time for me to reflect on the past year, but also a time for me to prepare for the upcoming year. Summer for me, is predominately consumed by the managerial, paperwork tasks that are required for a smooth running school year. I won’t lie to you though; there is more time for my family, a week long vacation, and an occasional long weekend or two. 17. Human Relations – Hiring, etc. 28. Update State ID’s for all new students including Kindergarten students for fall. Whew…..so there you have it, a list of the larger items on my agenda for this summer. This laundry list emulates a lot of what I manage during the school year, but is less “intense” if you will, because I am not trying to get into classrooms to observe students' learning, I'm not disciplining kids (except for my own), and I'm not communicating with families, students, and staff as often. I must admit as well, that I find time to rejuvenate and prepare myself mentally by taking my daughter to the pool and vacationing in Minnesota and Chicago, so that I can enthusiastically welcome students and staff in August! Have a GREAT summer ( I know I will)!